Among Stephen Sondheim’s most acclaimed musicals, “Follies” is the one most talked about and least seen. The songs have become extremely familiar because any Sondheim tribute, on stage or in cabarets, has to include “Losing My Mind,” “Broadway Baby,” and/or “I’m Still Here.” And since the score is Sondheim’s explicit tribute to the vaudeville stage in the first half of the 20th century, most of the songs detach easily from their dramatic content. Three factors keep “Follies” from being staged more frequently: 1) it’s about old people, which puts it out of reach for high schools; 2) it demands spectacle, at least in terms of dancers and costumes, so it’s expensive; and 3) the original 1971 production, co-directed by Harold Prince and Michael Bennett, two Broadway masters at the peak of their powers, was so lavish and so extreme in its exquisite casting, performances, and design (by all reports; I didn’t see it) that no one dared compete with it. 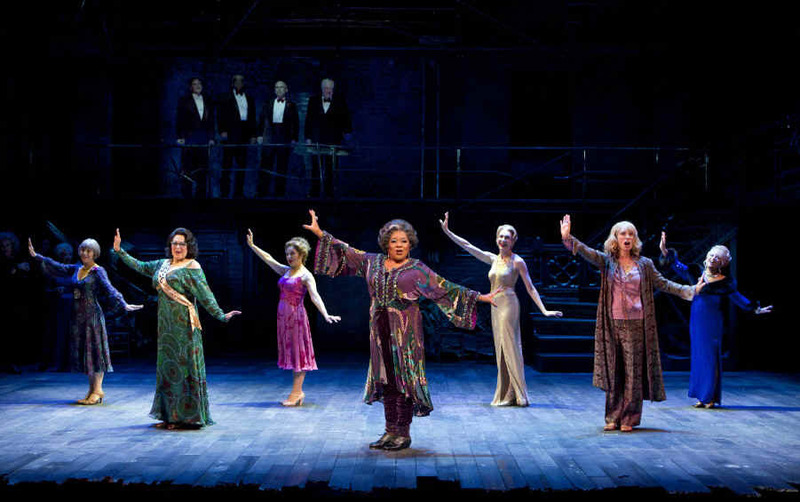 Beginning with the superb, star-studded televised “’Follies’ In Concert” in 1985 and then a London production in 1987, producers have grown less intimidated about mounting revivals, less slavishly attached to reproducing the splendiferous original. The current version, which comes to Broadway from the Kennedy Center in Washington DC, is not so different from the Roundabout Theater Company’s 2001 production in deciding that you can skimp on the magic as long as you get reasonably exciting performers and do justice to the score. “Follies” has a loose premise that creates the broad context for a more intimate, intricately plotted four-way romantic drama. A classy old-time vaudeville theatre is being torn down to become a parking lot, and Dmitri Weismann, the impresario who for many years staged an annual glitzy pageant (think Ziegfeld Follies), has invited all his former showgirls to a reunion. Here they are, a bunch of aged, jowly gals who’ve gotten thick around the middle, some of them glammed up in their finest duds, some not even bothering, but showing up to reminisce, drink heavily, and make a stab at recalling a few snatches of song and dance from their glory days. Inevitably and poignantly, they are accompanied by ghosts of their younger selves, a dozen phantoms in skimpy camisoles and big sparkly headdresses who haunt the action wordlessly but radiate alternating waves of curiosity, hope, anxiety, and indifference. 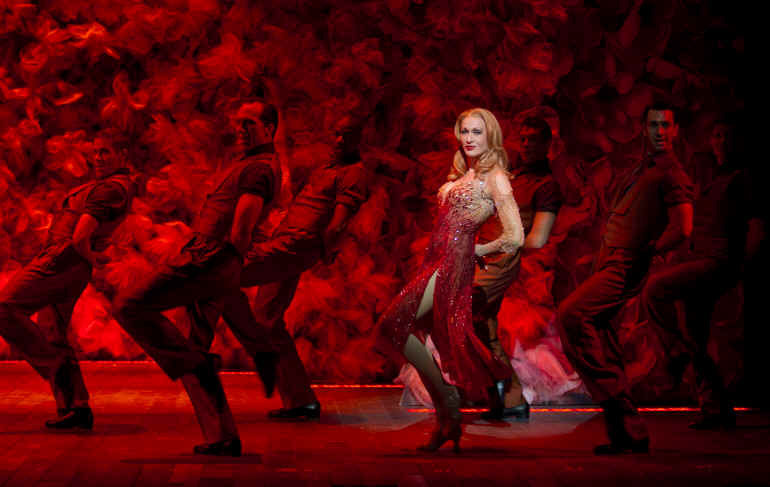 At the center of the show are a couple of former chorines, Sally (Bernadette Peters, above) and Phyllis (Jan Maxwell, below), who married guys they met when they were showgirls: Ben (Ron Raines, above), now a high-powered East Coast executive, and Buddy (Danny Burstein), a successful Midwestern oil salesman painfully aware of being far from the glamorous life. Nobody’s happy. After a torrid romance with Ben that ended with him marrying Phyllis, Sally married Buddy on the rebound but still carries a torch for Ben and heaps her neurotic loving onto her grown sons, leaving very little for her husband, who keeps a younger woman on the side. Meanwhile, Ben’s marriage to Phyllis has gone barren – lots of money and things, no kids, affairs they barely bother to keep secret. These various strands of showbiz spectacle, fading grandeur, and marital passion gone to the weeds get wound together with a throbbing undertone of regret. The youthful dreams of true love and happy lives that pop songs sell get harder to believe the older you get. If you try to hold onto them, they turn into cruelly elusive illusions -- yes, follies. The challenge Sondheim set for himself with this score was to write songs that both pay homage to the musical forms of vaudeville (brassy solos, comic numbers, witty banter, love ballads) while also commenting on them and the characters who sing them, and he slam-dunks it every time. Eric Schaeffer’s production gets a bunch of things right. The first act intersperses songs introducing the main characters with solos for a number of supporting players, each of whom gets her own show-stopper, and Schaeffer has stacked the cast with goodies. Down-to-earth roly-poly Jayne Houdyshell gives “Broadway Baby” a working-class spin. The legendary British stage star Elaine Paige (who was the first ever to sing both “Memory” and “Don’t Cry for Me, Argentina”) as Carlotta does a cool, regal job asserting “I’m Still Here,” one of Sondheim’s most fiendishly clever list songs. (“First you’re another sloe-eyed vamp/Then someone’s mother/Then you’re camp/Then you career from career to career….”) And Terri White (below center) pretty much steals the show leading the “mirror-dance” number, “Who’s That Woman?” James Moore’s music direction, working with Jonathan Tunick’s classic orchestrations, is solid throughout. Schaeffer made a choice to take James Goldman’s book quite seriously and to foreground the dramatic scenes, which play with real depth, nuance, and at times surprising emotion. All four characters are pretty demanding, because they could so easily lapse into flat, musical-theater types, and their interplay verges on soap operatics. But for the most part Goldman and Sondheim have given them complex material and songs that convey unusual emotional sophistication. Jan Maxwell plays Phyllis’s brittleness, yes, but also many unexpected flavors of vulnerability and actual longing for Ben’s love. Her “Could I Leave You?” is not just a bitchy diatribe but a cry from the heart. I’m not always a fan of Danny Burstein’s shtickiness but it’s really dialed down in his performance as Buddy, who’s not as much of a pushover as he first looks. And Ron Raines beautifully underplays the struggle it takes for Ben to hide the pain behind his solid public persona. 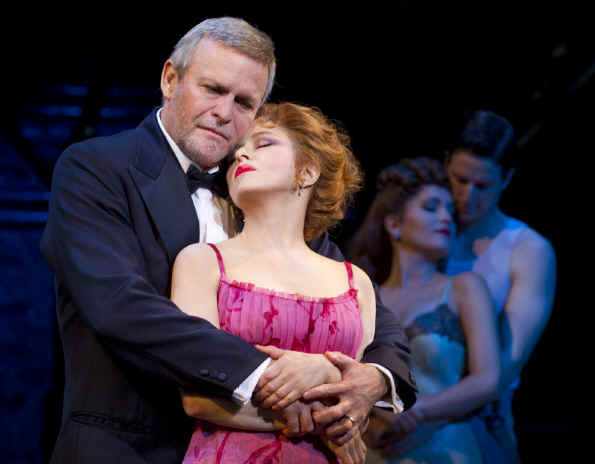 Bernadette Peters is a charming performer and a lovely singer (hers was the first version of “Broadway Baby” that I ever heard, on her second pop album way back in 1981) but her skills as an actress are limited and unsuited for the role of Sally. Nothing anyone else says about the character reads in Peters’ performance – she’s either afraid or unable to convey cruelty, mean-spiritedness, or delusional obsession. Although she’s nominally the star of the show, and the reason many theatergoers are buying tickets, Peters is definitely The Weakest Link. “Follies” is a rich, complicated show, and even with its imperfections this revival stands alongside John Doyle’s recent revivals of “Company” and “Sweeney Todd” as a valuable entry point into Sondheim’s major work.